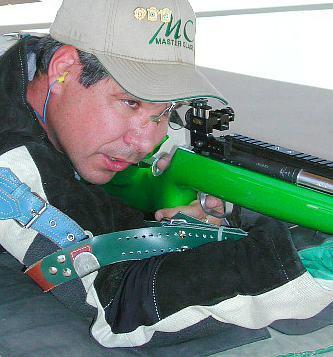 Copyright © 2005 Precision Shooting Magazine and German Salazar. Reprinted by permission. 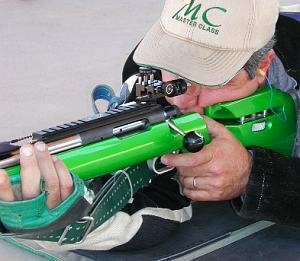 300 Meter matches can be either three-position (prone, standing, kneeling) or all prone. Being of that age at which limbs aren’t limber and the mid-section obscures one’s view of the toes, I shoot prone matches only and leave the 3P to those for whom the term “shooting athlete” doesn’t produce an automatic smirk from the better half. Like most 300 Meter shooters, I shoot a 6BR as my main rifle. As used in 300 Meter shooting, the 6BR is loaded with a 105- to 108-grain bullet, with a velocity in the 2850 fps range. There is simply no cartridge out there at this time that delivers the accuracy, low recoil and ease of loading that can be had from the 6BR. That doesn’t mean we shouldn’t embark on a quixotic adventure now and then to find something better. This article is about one such search. So, if you don’t mind spending some time learning about an uphill struggle in a forgotten corner of the shooting world, pour a hot cup of coffee, get a plate of chocolate chip cookies and read on. The premise for building a .22 PPC was simple–less is more. 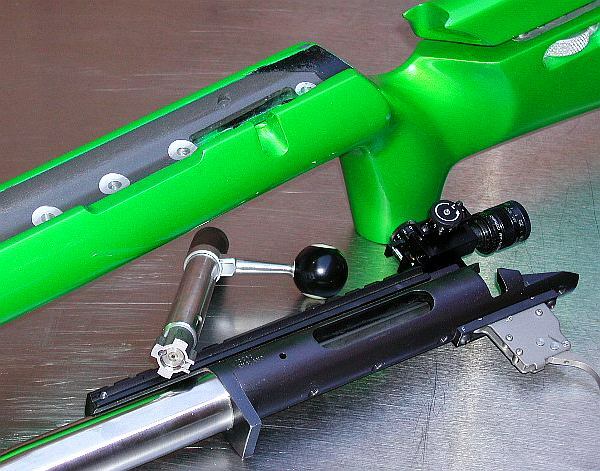 Less recoil, that is, while retaining good ballistics and accuracy, should allow for higher scores. The hard part is meeting the ballistic and accuracy standards set by the 6BR. If pressed I might also admit to a desire to do something different. I made a decision early on in the project to stick to 80-grain bullets. I believe the 80 is pushing the envelope for safe and sane pressure in a case the size of the PPC; additionally, there are a number of manufacturers of 80-grain .224″ bullets so selection and testing can be more meaningful. Barrels are another consideration and all of the better barrel makers offer a 1:8″ twist .224 barrel (unlike the limited selection of 1:6.5″ twist required for 90 grain .224″ bullets). With the basic parameters of a full-length .22 PPC case (reformed Lapua .220 Russian to be exact) and an 80-grain bullet established, a few other details needed attention. The first of these was specifying certain dimensions for the reamer maker. 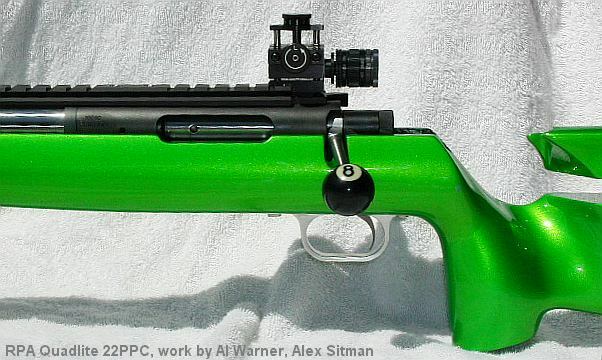 I chose not to change any of the essential dimensions of the .22 PPC such as headspace, shoulder angle or body taper, but there were a couple of areas that I felt needed to be different from the typical Benchrest PPC. These were neck diameter and throat length. With the outstanding quality of the Lapua brass, I elected to go with a 0.255″ neck diameter which would allow the use of unturned brass and still leave 0.002″ clearance around the neck of a loaded cartridge. 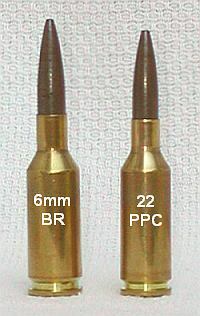 The throat was specified longer than a standard PPC to allow for the length of the 80-grain bullets and avoid having the bullet go past the neck/shoulder junction. Action: RPA Quadlite, RPA-Eng.com | CreedmoorSports.com. 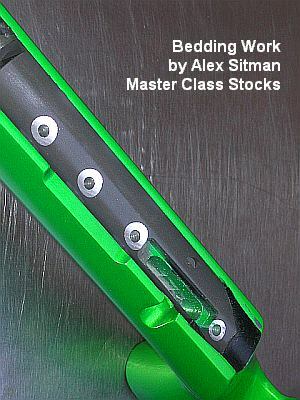 Stock: Master Class Highpower Prone MasterClassStocks.com. Barrel: Broughton .224″ bore, 1:8″ twist, 30″ Palma contour, Rifle-Barrels.com. 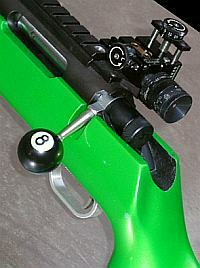 Rear Sight: Warner #1, Anschutz Iris, Warner-Tool.com. Front Sight: Scott Riles, Gehmann Iris, RilesMachine.com. Trigger: Jewell 4 oz. one-stage, Jewell Triggers, (512) 353-2999. Stock inletting, pillar bedding, and hardware: Alex Sitman, Master Class Stocks. Like Quixote stumbling his way to his dreams, I’ve made a few mistakes. That 0.255″ neck diameter turned out to be the first. Turning brass isn’t a problem, but I was so captivated by the quality of the .220 Russian brass that I planned to skip turning or just take a light (0.001″) clean-up cut. Well, that’s fine, but as it turns out, PPC die makers assume you have turned necks and using unturned brass causes problems. The Redding Competition Seater, for instance, wanted to crimp the entire length of the neck onto the bullet. Turns out it was 0.250″ in the neck diameter of the sliding sleeve. This required reaming the sleeve which wasn’t too hard as the sleeve is made of relatively soft steel. Hand turning the chambering reamer with lots of care and oil took care of that problem. This opened up the neck to 0.255″ which might be 0.001″ more than ideal but I’ll live with it. Sizing dies were another problem altogether. Forget using a non-bushing die with unturned brass–you’ll just overwork the neck to death. The Redding bushing dies worked well, though. Fired brass ends up at 0.254″ and is sized to 0.250″ in two steps (0.252″ and 0.250″) to maintain better concentricity. I also got the throat length wrong as the base of the bullet (above the boat tail) is halfway up the neck and I want it just above the shoulder. I don’t know how I missed on that spec, but that’s what happened. As it turns out, the extra throat length hasn’t caused any problems with the Nosler 80, but it might with shorter or pointier bullets. Powder and primer choices became additional areas for demonstrating my inability to make good choices. You might think that adding a heavier bullet to an existing cartridge would be simple but it really turned into a full scale adventure. Based on my previous favorable experience and that of a few friends, I ordered a Broughton barrel for the PPC, a .224″ bore 1:8″ twist, long enough to finish at 30 inches in what is generally referred to as a medium Palma taper. I haven’t been disappointed by the barrel: like all of those made by Tim North (proprietor of Broughton Barrels) it is top notch. With the barrel and reamer in hand, they and the RPA Quadlite action were sent to Al Warner for barreling and then on to Alex Sitman for the stock. I can’t say enough good things about Alan’s metal work and Alex’s stock work. They have barreled and stocked many rifles for me over the years, all flawless. Alex’s Highpower Prone stock fits me like a comfortable moccasin. The trigger is a Jewell set at 4 oz., the rear sight is a Warner #1 and the front sight is a Scott Riles with a Centra aperture. Eventually, the UPS man–purveyor of all things worth having–arrived with a long package and the real work began. Load testing and shooting can be a lot more frustrating than planning and talking to gunsmiths, but hopefully the eventual results make it worthwhile. I had a good supply of Nosler 80-grain bullets and some preconceived notions about powder and primers. Off to the loading bench. Fire forming the .220 Russian cases to the PPC chamber was a breeze: run an expander into the neck to get them to .224″, bump the shoulder 0.002″, load a caseful of IMR 4895 (about 23 grains) and insert a Nosler 77 (leftover from another project) and fire. I shot these at 100 yards while zeroing the rifle and was very impressed with the accuracy. Fouling was minimal, off to a promising start. 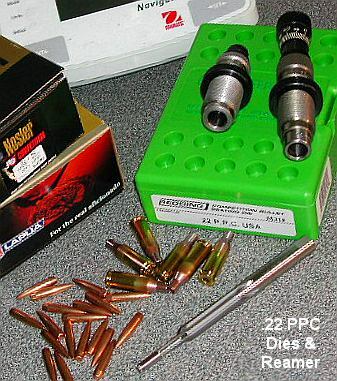 Once formed, I loaded the brass with Varget and the 80-grain bullets. Since Varget has given such good results in the 6BR, it was a natural starting point for this project. However, it quickly became evident that it might be too slow. While accuracy was excellent, powder fouling in the barrel was very heavy even at the highest charge tried (28.5 grains) and there was soot all the way down the shoulders of the cases. Cleaning the bore felt like patching a rusty water pipe after just 20 shots. I knew I’d never make it through a 60 shot match (about 70 shots with sighters) without cleaning (and there’s rarely time to clean). At this point, I took the PPC to a 300 Meter match with the Varget load. While it might not look perfect, I needed to try it. The first string was a 198 and I was able to clean the rifle immediately after firing. The second string was also a 198 but I had to fire the third string without cleaning. The effects of the fouling were evident in the last score, a 194. While a 590 total isn’t bad for 300M, it was a bit below my average with the 6BR at this range – my home range that I knew well. More importantly, the score dropped as the group opened up in the third string when I wasn’t able to clean. At the Nationals all 60 shots are fired without a break for cleaning or additional sighters; therefore, Varget, while promising, wouldn’t work in the long run. The next faster powder on my shelf was IMR 4895. I’d used it in the fire forming loads and if I had a lick of sense I would have tried it right away since the fire forming loads shot so well. However, stubbornly clinging to the preconceived notion that Varget was going to be a great powder for this combo cost me a month or so fooling with it. I then worked up loads with 4895 from 26.8 to 28.6 and saw that while 4895 was better suited to the case than Varget, it was still slow. The powder fouling was still occurring, though to a lesser degree. The shoulders still showed some soot, but less. I settled on 27.8 grains as a useful load and loaded 70 cases. At this point, I moved from Florida to Arizona causing a delay of several months in testing. The move also had an effect on the load as the hotter and drier climate in Arizona turned out to be much more suitable for 4895. Of course, I still had those 70 rounds loaded with 27.8 so I shot them in practice. Everything seemed OK but one primer (Fed. 205M) pierced at the edge. I didn’t pay much attention to that as there were no other pressure signs and it was the first primer failure of any sort so far in this project. Extraction was fine, primer edges were nicely radiused and base growth was under two tenths. There was an opportunity to shoot a 500-yard prone match the following day so I reloaded the cases with the same load. At the match I pierced two more primers, this time right at the edge of the firing pin, causing two craters running into the firing pin hole. As you might imagine, all subsequent shots cratered into that area, although no more pierced. I was contemplating a switch to Hodgdon Benchmark (slightly faster than 4895) until this point. Now, repairing the bolt face and switching to a tougher primer took priority. I loaded 25 rounds with CCI BR4 primers and 25 with Remington 7.5 primers. Both of these are well known for their tougher cups which I hoped would eliminate the piercing. I like the mild flash from the Federal 205 and believe it contributes to good accuracy, but I needed a primer that holds together more than I need to cut another tenth MOA. Bearing in mind that the powder charge itself might need reworking, I took those 50 rounds to the range to test them with the 27.8 gr. IMR 4895 load as it remains best to only change one thing at a time. Temperatures were in the 100 to 110 degree range during testing as they are for a good portion of the year here in Phoenix. If the load won’t work in hot temperatures, it just won’t work at all for me. The primer testing at 200 yards showed the CCI BR4 primers to be better suited to this load than the Remington 7.5 primers. While no primer failed out of the 50 fired, the CCI BR4 primers gave distinctly better accuracy. I fired two ten-shot groups prone (scoped) with each, the Remington-primed groups averaged just over 1 MOA and the CCI-primed groups averaged 1/2 MOA. The difference between the two was principally in the amount of elevation in the groups. Given that result, as well as previous good experience with the CCI primers in the 6BR, I settled on the CCI BR4 primers for the PPC. 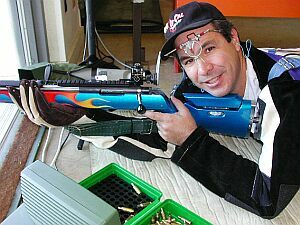 While the purpose of the 80-grain PPC is 300 Meter shooting, those matches are somewhat hard to find (as mentioned earlier) so I’ve done most of my testing at 200 yards on the local public range (Ben Avery Shooting Facility, BASFaz.com) and at 500 yards in some of the local prone matches. With the primer issue potentially resolved, I went back to the 500-yard range to make sure the load held good elevation at that distance. Final testing at 500 yards was a complete success. I fired one group of 24 shots from the prone position. Elevation for the bulk of the group was right at 3″ (0.6 MOA), the horizontal spread was somewhat larger as the group was fired in gusty, fast-switching conditions. The CCI BR4 primers functioned flawlessly, with no sign of pressure despite ambient temperatures over 100° F. None of this should be taken as a general statement of inadequacy of Federal primers. I have used (and continue to use) the very same lot of Federal 205M primers in my 6BR and have not experienced any problems at all. Simply stated, the 80-grain .22 PPC is an odd duck and has special requirements when fired under the conditions that prevail in my area. At this point, I’ve determined that the basic premise of a .22 PPC for 300 Meter matches is perfectly viable, even if it is quite a bit more complex an undertaking than the 6BR. Recoil reduction over the 6BR was minimal, bordering on unnoticeable, but accuracy is on a par with the 6BR, perhaps slightly better. As a nice bonus, the PPC has proven to be quite useful for the 500-yard prone matches that are a regular part of the Phoenix shooting scene and it never fails to spark a good conversation with a new friend when I’m practicing or testing at the range. Future plans include testing Berger and Hornady 75 and 80-grain bullets and Hodgdon Benchmark powder. And, after conferring with your moderator, who ran some simulations in QuickLOAD, I’ll be trying Reloader 15 soon (QuickLOAD predicts RL15 allows 100% load density with good velocity). At some point I’ll also have the reamer reground for a shorter throat and tighter neck, but probably not until time comes to rebarrel. For the shooter who wants a superbly accurate, easy to load cartridge for 300 Meters to 600 yards, you simply can’t beat the 6BR. Everything you need, including brass, dies, reamers and knowledge are just a phone call away. 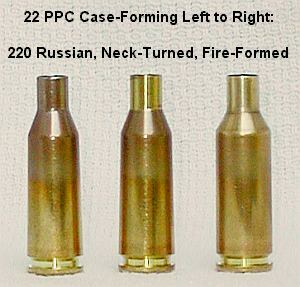 The .22 PPC, by contrast, is an uphill struggle. The chambering reamer was custom ground to my specifications to allow unturned brass, as well as a longer freebore for the 75- and 80-grain bullets that are the heart of the project. The no-turn necks also meant that the Redding Competition Seater (an excellent unit) had to be reworked to allow for the thicker neck diameter. Once those hurdles were overcome I struggled to find the best powder for this combination–and I’m still searching. Unlike the 6BR where any of a half dozen or more powders will do the job (Varget, Reloader 15, N140, N540, IMR 4895, Norma 203B, etc.) the .22 PPC with heavy bullets has proven finicky with even the most accurate powders leaving fairly heavy carbon fouling. Despite the problems, the .22 PPC offers a bit more pure accuracy than the 6BR and also a tiny bit less recoil. Both of these things can contribute to slightly higher scores in prone matches. However, to get the most out of the PPC, one must find the time to clean between 20 shot strings–a not inconsiderable effort sometimes in the mad rush of pit changes, scoring, shooting and just plain being tired. This rifle was initially a .223 and when that cartridge proved unsatisfactory for my purposes, I had it rebuilt as the .22 PPC you see here. I like it and I enjoy the challenge, but I would not recommend this combination as someone’s primary rifle; it can get a bit frustrating. To put it into another context, the 6BR is like a 350 Chevy, it’ll just keep on doing the job forever, no matter what. The .22 PPC is like a Ferrari, it’ll scream when you do everything right, but it takes more attention to detail and a lot more maintenance. You wouldn’t want a Ferrari as your only car and likewise, you would be better off making the .22 PPC a second rifle. if you’re someone who finds the journey as rewarding as reaching the destination, then you may very well enjoy a .22 PPC for prone shooting. While I received a great deal of help in this project from friends, gunsmiths, suppliers and parts makers far and wide, I really must acknowledge the huge debt we all owe to Ferris Pindell and Dr. Lou Palmisano. Without them there would be no PPC. We truly stand on the shoulders of giants. Copyright © 2005 Precision Shooting and German Salazar, All Rights Reserved. Layout and design Copyright © 2010 AccurateShooter.com | 6mmBR.com, All Rights Reserved. Topics: German Salazar, ShootersJournal.com, Precision Shooting, Ben Avery, Arizona, NRA, HighPower, High Power, 300m, 300 meters, 22PPC, .22, .22 PPC, .220 Russian, Lapua, Nosler, Hornady, Hodgdon, H4895, IMR 4895, Alliant, Reloader 15, Varget, Reloader 15, N140, N540, IMR 4895, Norma 203B, Record, 500 yards, 600 yards, 600yd, 600-yard, RPA International, RPA Engineering, Graphite, Broughton, 6BR, 6mmBR, 6mm BR Norma, 6mm Benchrest, Warner Tool, Warner #1, Riles Machine, Riles Sight, Jewell Trigger, Vihtavuori, Federal, CCI, CCI BR4, primer, Lapua Brass, Benchrest.